She couldn’t – could she? With the same spirit she showed throughout her run to the BNP Paribas Open title, Bianca Andreescu came from a set down, saving match point at 5-2 in the second set, to beat Irina-Camelia Begu 4-6, 7-6(2), 6-2 in the first round of the Miami Open. 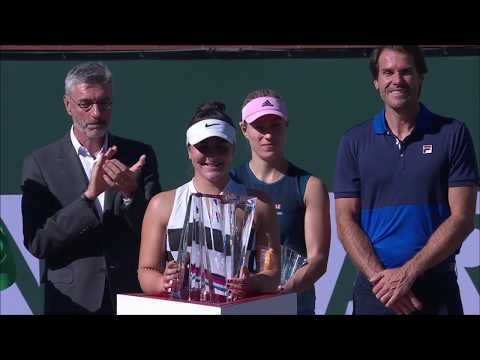 Fresh from her remarkable victory over Angelique Kerber in Sunday’s final at Indian Wells, Andreescu put on another see-it-to-believe-it display to knock out Begu – who, incidentally, she also defeated in the first round in California. All the talk before the match was focussed on whether the 18-year-old could channel enough energy after the exhausting couple of weeks she experienced in Indian Wells. In the first set in Florida, that talk seemed warranted as the Canadian fell 6-4. The second set didn’t start much better as Andreescu fell to a 5-2 deficit. It was then that Begu manufactured a match point on her own serve. But out of nowhere, Andreescu bounced back to break the Romanian twice in a row before winning a tense tiebreak 7-2. From there it was plain sailing for the Mississauga-native, who broke Begu twice in the third set before going on to win it 6-2. Just an hour earlier, fellow 18-year-old Canadian Félix Auger-Aliassime claimed his own come-from-behind victory over junior rival Casper Ruud in the first round. The battle of qualifiers got off to a nervy start, with neither player particularly dominant behind their services. After four consecutive breaks, however, it was the Norwegian who was able to steady his ship, claiming the first set to earn the early advantage. In the second set, however, it was Auger-Aliassime, who currently finds himself at career-high ranking of No. 57 in the ATP Rankings, that was able to reel in his unforced errors and dictate play. Rushing Ruud into backhand errors and aggressively attacking the middle to earn easy putaways, Auger-Aliassime raced through the second set to level proceedings. The momentum would ultimately stay firmly with the Montreal native in the decisive set. After securing an early break of the increasingly attackable Ruud serve, Auger-Aliassime took another break, ensuring a comfortable close to the match by a 3-6, 6-1, 6-2 scoreline. Up next for the Canadian is No. 29 seed Marton Fucsovics of Hungary, who owns a 1-0 head-to-head against the young Canadian, having narrowly prevailed the first round of the Vienna Open last season, 7-5 in the third.